Located directly across the Seven Seas Lagoon from Disney’s Magic Kingdom is a signature restaurant with a wonderful perk, we are talking about ‘Ohana. This restaurant is nestled inside of Disney’s Polynesian Resort. As a one credit Disney Dining Plan option, you are sure to have your expectations surpassed in true Disney style! We highly suggest that you make a reservation just before the Wishes fireworks. ‘Ohana features a fabulous dining room with floor to ceiling windows for the perfect viewing of the Nighttime Spectacular! 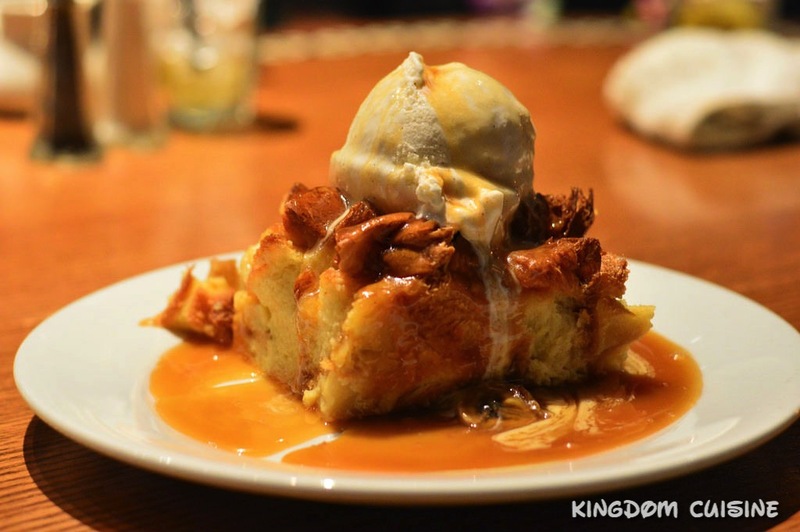 ‘Ohana features a delicious dessert to top off your magical evening, a signature bread pudding with bananas foster sauce. This decadent bread pudding is topped with a nice scoop of vanilla ice cream that slowly melts over the fresh bread pudding. Disneyfy your magical parties with this delicious recipe! Preheat oven to 350ªF. In a large mixing bowl, whisk together eggs, salt, sugar, cinnamon, nutmeg, and milk. Stir in bread cubes, pineapple, coconut, and raisins (optional). Pour into a 13x9x2-inch pan coated with cooking spray. Bake for 1 hour and 10 minutes. Remove from oven and let stand for 5 minutes. Serve the hot bread pudding with a scoop of vanilla ice cream and top with warm bananas foster sauce. While the bread pudding is baking, in a medium saucepan over high heat, combine brown sugar, corn syrup, butter, and half of the cream. Bring to a rolling boil. Boil for 10 minutes, then add remaining cream. Boil 1 minute more. Add rum and vanilla, Flambé using a long-stemmed lighter. Let boil until the flame goes out. Reduce to a simmer and stir with a heatproof spatula. Add bananas. Remove from heat and set aside.